160. Can you set default access in Organization wide default for detail objects (detail object in case of master detail relationship)? Ans - No, Detail object will always have default access as 'Controlled by Parent' and it cannot be changed. 161. Can you create sharing rules for detail objects? Ans - No, this cannot be done. 162. Can standard object appear as detail object? Ans - No, you cannot have standard object as detail object in case of master detail relationship. 163. What are the differences between list and set? 2. elements stored in list are ordered while those stored in set are unordered. 164. What various default accesses are available in OWD? 165. What are the different types of reports in salesforce? 166. Can a user not have a role? Ans - Yes, this is possible, Role is not mandatory for user. 167. Can a user not have a profile? Ans - No, a user should always have a profile. Profile is mandatory unlike role. 168. How many custom fields can be created on a object? 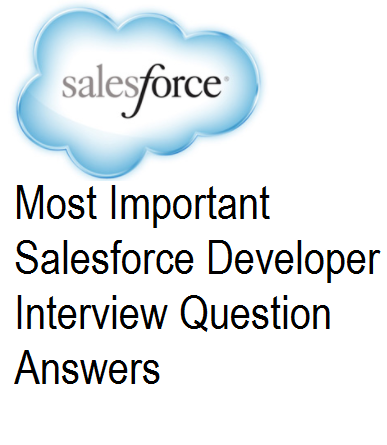 Ans - Initial limit is of 500 fields and if needed this can be extended to 800 by raising a case with salesforce.